The United Kingdom is not ready to exit the European Union by the Mar. 29 deadline, Scottish First Minister Nicola Sturgeon said in a speech at Georgetown University Feb. 4. The United Kingdom needs to request an extension of the deadline, Sturgeon said, to make time for a new Brexit referendum to override the Parliamentary gridlock. Sturgeon advised that the United Kingdom should at least reconsider the close European partnerships that were previously ruled out in 2016: partnerships inclusive of membership in the customs union and single market, which she said are essential to the long term health of the Scottish economy. According to Sturgeon, without continued migration to Scotland from the rest of Europe, a shrinking working-age population will struggle to support the expanding elderly one. “By impeding free trade in order to end freedom of movement, the U.K. is in the bizarre, absurd position of doing something that will harm the U.K. and Scotland in order to do something else that will harm the U.K. and Scotland,” she said. In the 2016 Brexit referendum, the majority of Scots voted to remain in the European Union, contrary to the narrow victory of Brexit in the rest of the Kingdom. Two years prior, the Scottish people voted in a different referendum on whether Scotland would remain in the United Kingdom. The motion for independence failed, but the decision, Sturgeon said, was based on critically flawed reasoning. Sturgeon also said that she plans, within the next few weeks, to motion for a new referendum on Scottish independence. Her visit to Georgetown was part of a larger tour around the United States and Canada, which itself is part of a larger effort to promote Scottish interests on an international scale. 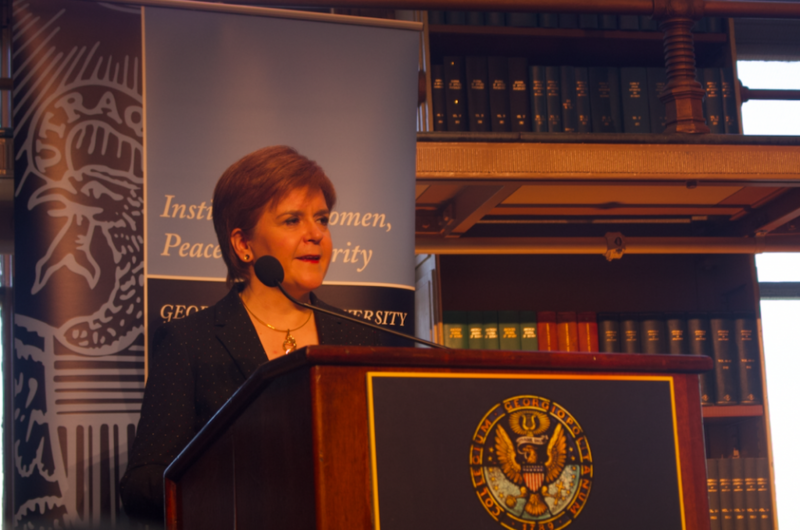 Georgetown hosted Sturgeon as a part of a week-long event through the Georgetown Institute for Women, Peace and Security. The event also featured Amat Alsoswa, Yemen’s first Minister for Human Rights and first female cabinet member, on Feb. 8.